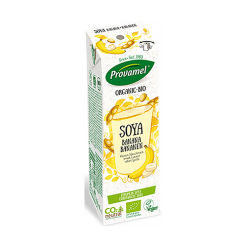 Delicious organic banana soya milk. The sweet taste of the sun and tropics is caught in this tasty organic banana soya milk. It can be used as a basis for smoothies but, due to its convenient size, it is also perfect for carrying as a snack, to be enjoyed any time of day. Ingredients: Organic hulled soya beans, organic raw cane sugar, organic corn maltodextrin, natural banana flavouring with other natural flavourings, sea salt.